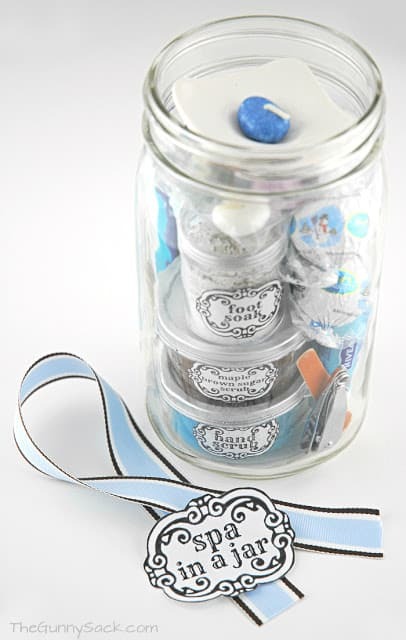 A gift in a jar will not only impress the recipient but it is also fun to make! I am taking the gift jar idea a bit further by combing it with Valentine’s Day ideas. Last week, I shared the Ice Skating Date In A Jar. 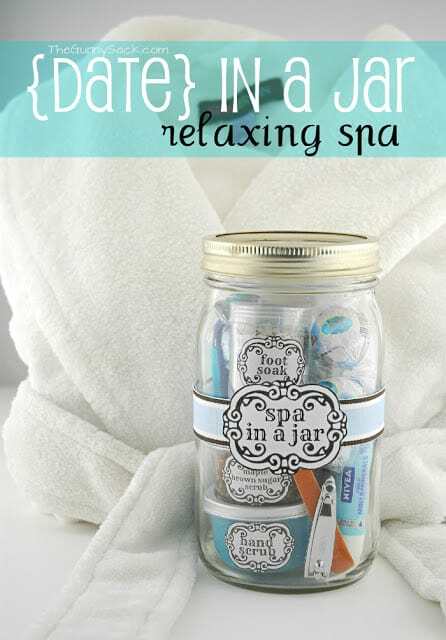 This week I am showing how to make a Spa In A Jar so you can have a relaxing spa date at home! 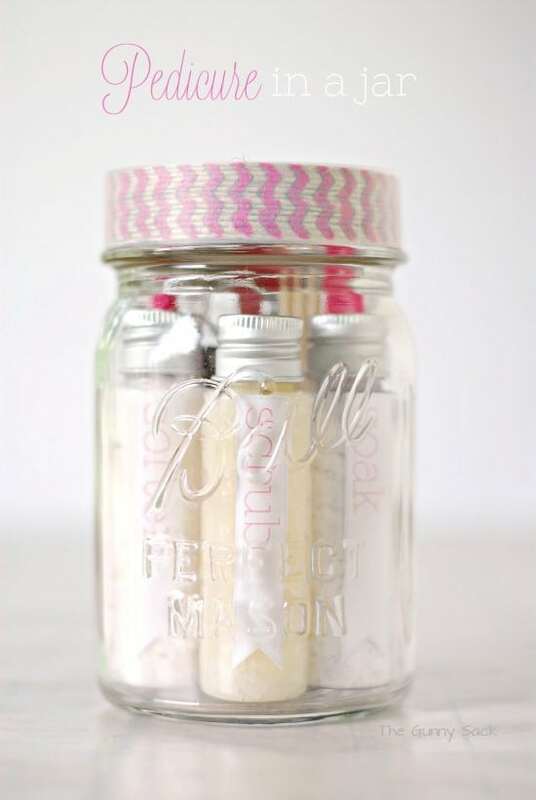 I have some home spa treatment recipes from previous posts so I included them in this mason jar. 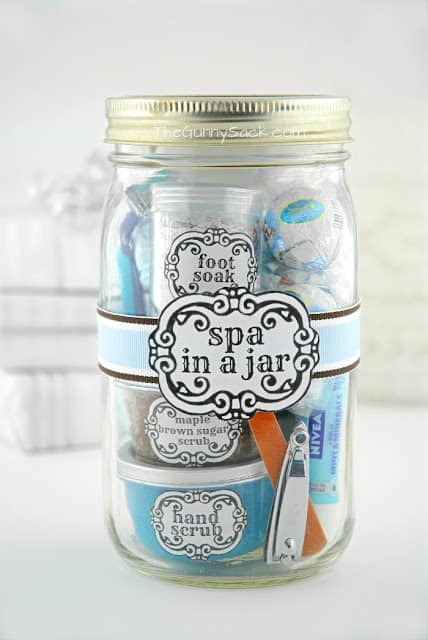 A Spa In A Jar could be given for many occasions besides Valentine’s Day! My teen saw me making it and said she would love to have it when I was done. 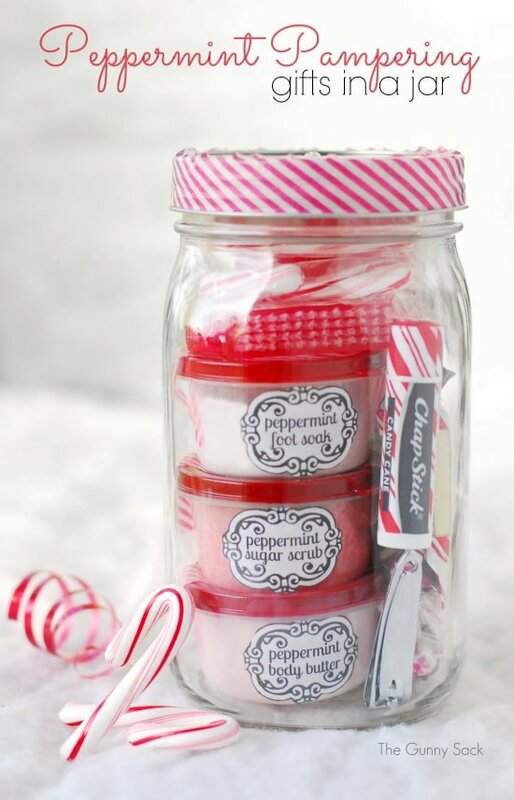 If you are making this for a date, be sure to make two jars so that you can each use all the treatments! Start with a Kerr wide mouth, quart size mason jar to hold everything. 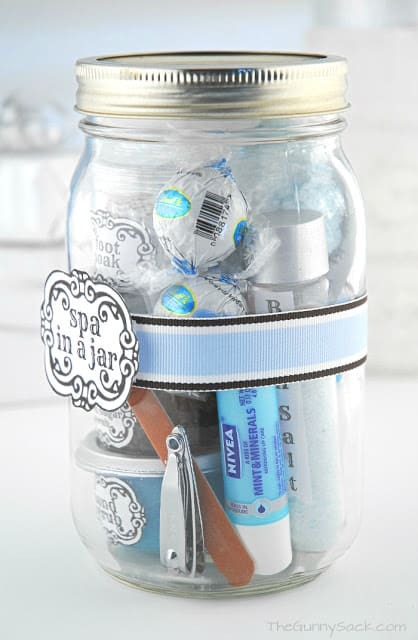 I tried to stick to a blue color scheme to make the jar look pretty but it isn’t necessary if you can’t find matching items. I also included the following home spa treatments that I made myself: Lavender Bath Salts, Maple Brown Sugar Scrub, Sugar Hand Scrub and Peppermint Tea Foot Soak. You can click on each one for the recipe and links to the printable labels. Slowly add the items to the jar with the content labels facing the outside so that the recipient can easily see what is in the jar. It took several attempts to get everything to fit into the jar and I kept adjusting it until it looked right. Once it was all in, I printed the Spa In A Jar label and cut a length of ribbon which I attached to the jar. You can download the free printable here. I printed it by choosing “wallet size” and it was perfect. Let’s take a little spin around the jar so that you can see it from all sides. Wondering what else you could put in this jar? How about a face mask, lip scrub, foot scrub, pore strips, massage oil, perfume, hand cream, foot lotion, socks, eye mask and tea light candles. 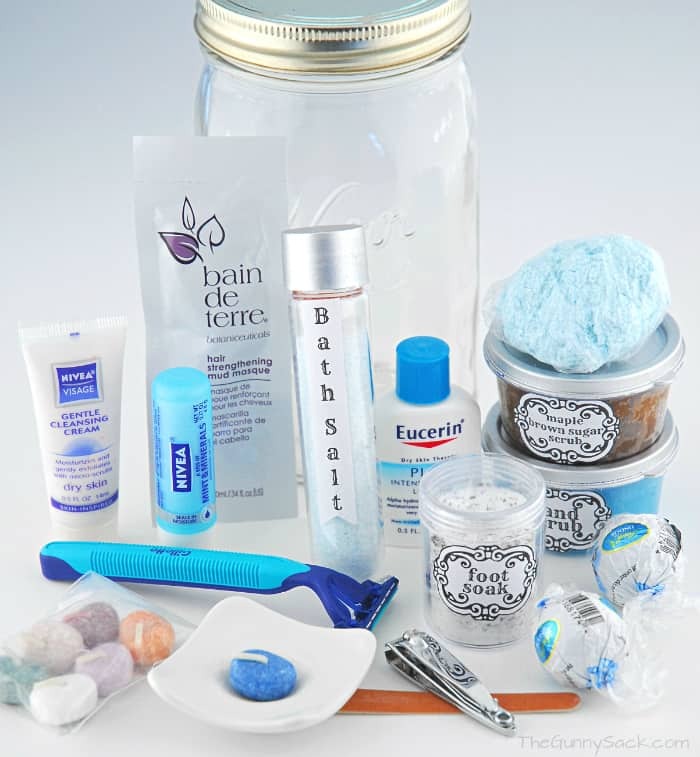 I am going to try to find some mini sized spa items for men so that I can assemble a jar that is specifically for men. Not that any of these items are too flowery or girly but I’m sure a guy would appreciate receiving products with scents geared toward men. There have been a lot of questions about the exact containers I used so I purchased another package for this photo. I should’ve taken a picture before I painted the original ones but I didn’t even think it of. 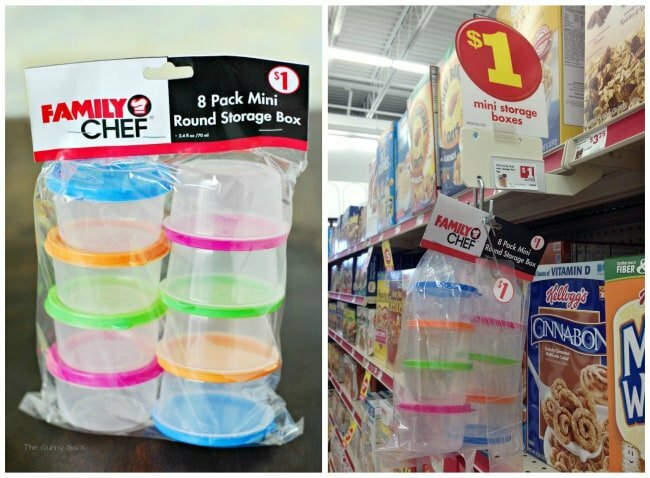 I found these containers at the Family Dollar in one of the food aisles as a hanging extra. You know the little things that are hanging between the items on the shelves? Each container holds 2.4 oz and they cost $1.00 for the 8 pack. 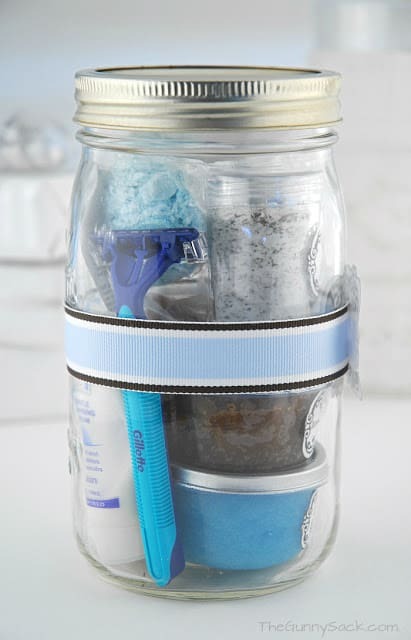 The foot soak jars are these bead storage containers. A fluffy bathrobe and cozy slippers would be the perfect things to give along with the Spa In A Jar! I noticed that your foot soak in the spa in a jar is in a different container. Do you have a pic of that or know where you got that container? Thank you for all these wonderful ideas! Can’t wait to try some! Great gift idea! Definitely going to use it. Thanks for sharing! 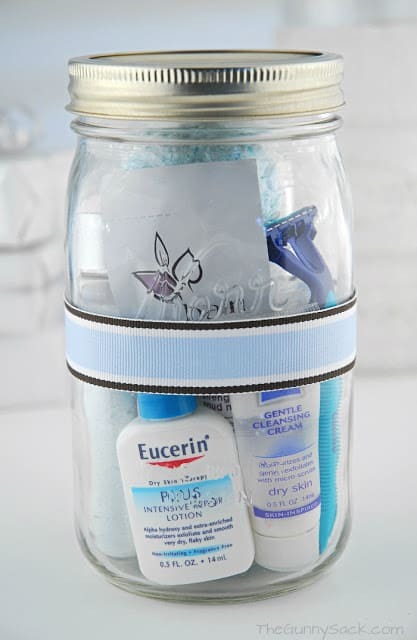 I really love the idea of the spa in a jar for a cute DIY project. I have been using your recipes to make the jar with ingredients for my research project for english class. If you would be willing to answer an interview by email for one of my sources, that would be amazing. This post is so inspiring and cute. I love this idea. Would be a great gift idea for Mother’s Day. Hope you don’t mind if I put a link to this on my blog for my Mother’s Day gift ideas round up. Eu simplesmente amei essa ideia!!!!! PARABÉNS!!!!!! I was wondering what type of paint did you use for the silver lids on the plastic containers? Amazing gifting idea. Will definitely try. Hey I love this idea! I am making them for my family this christmas but I wanted to add some extra things and I was wondering if you knew the name of the font you used to make them? Hi Tonia. I aboslutly loved this idea and I made some to give to my sister and mother in law! I was having trouble finding the correct sized container, but for those who are having the same trouble, Target has the perfect sized containers in their travel section. Love your site. Great ideas for me and my daughter to do together. What size jars did you use? Hi, I was just wondering how you attached your labels to the small tubs? I’ve used everything from Mod Podge to glue sticks to hot glue and even double stick tape and glue dots. Merry Christmas! Hi hun, I was searching through the net with my kids (5&6 yrs) & came across your gifts in a jar, the kids (both boys) love them! They are excited to make the moisturisers, body butters & sugar scrubs…. How long would you say they will last for? As I need to make them up but dont want to make them up too soon if they are going to go bad. Thank you! The closer you make them to Christmas the better off you will be. I would suggest that you use them with a month or two to be safe. But in reality, we found some extras in our cupboard 6 months later and it was fine! Have fun! Thankyou for such a swift reply, In that case I will leave it another couple of weeks then will make them all up after my youngests birthday on the 15th. Thanks again. This is a great idea! I’ll be making some for Christmas. One note though, be careful with the chocolate. Chocolate, especially good chocolate, will absorb scents. Just keep that in mind if you plan to make these really far in advance. I love this post! I stumbled a crossed it will searching for gifts for my bridesmaids. I think they will love this. I tried clicking on the links to download the labels (templates), however it is not working. Is there another way I could get the download?